In September 2010, Minecraft was just over a year past its initial, unfinished release. A “full” version wouldn’t come out for 14 more months. If not for one single meeting that month, the indie game phenomenon could’ve gone down a very different path. 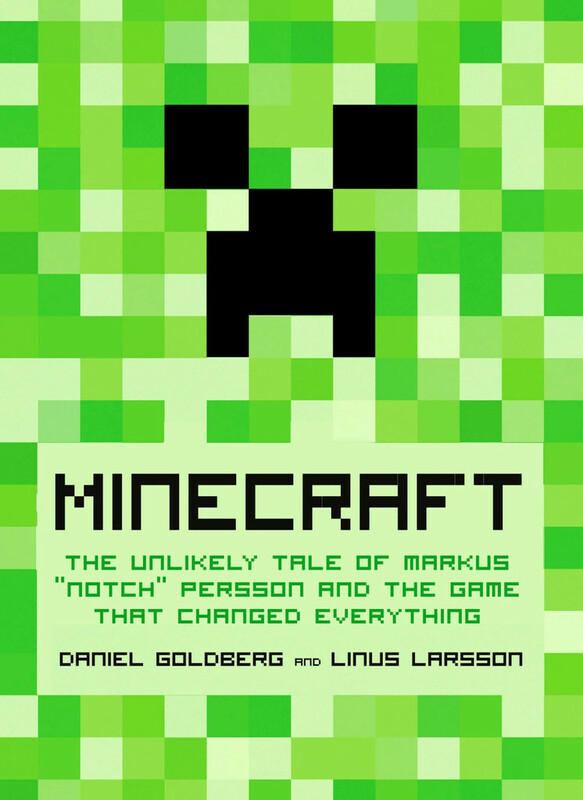 This chapter from “Minecraft: The Unlikely Tale of Markus ‘Notch’ Persson and the Game that Changed Everything,” excerpted with permission of the authors, tells the tale. It finds Persson, the game’s original creator, coming to terms with Minecraft’s burgeoning success, as his former coworker Jakob Porsér considers taking a management job at Midasplayer, a.k.a. King, pre-Candy Crush Saga. The chapter also touches on Persson’s sister Anna and father Birger’s attempts to overcome drug addiction, which are fleshed out more in other parts of the book. July 2010. it was morning as Markus logged onto his computer at home, as part of the morning routine he had developed and rather enjoyed. Every time someone bought a copy of Minecraft, he received an e-mail. Since most customers were in the United States, most of those e-mails came in while Markus was asleep in Sweden and when he woke up, the purchase confirmations would be waiting for him in droves. Not only had clicking through them become second nature, it put him in a great mood. To Markus, those e-mails symbolized the acknowledgement of all his hard work and bore the fruits of his labors. And so many people willing to pay for Minecraft was a pretty good indication that things were going pretty well. On this particular morning, four hundred e-mails were waiting in Markus’s inbox. Four hundred people had bought Minecraft in the past twenty-four hours. Markus leaned back in his chair. He did some quick mental math. And he concluded that about $5,800 had found its way into his bank account since yesterday morning. A new record. The default Minecraft avatar, Steve. It had been a little over a year since the spring day when Markus first introduced Minecraft to the gaming world. A little over a year ago he hadn’t, not in his wildest dreams, imagined that the game would make any money to speak of. For one thing, it wasn’t exactly easy to get hold of. Minecraft wasn’t available on Steam, Xbox Live Arcade, or in any of the other established online outlets. Those who wanted to try it had to somehow find their way to Minecraft.net, a simple website Markus built, then laboriously enter their credit card numbers, download the game, and install it on their own machine. Not exactly user-friendly and hardly optimal from a marketing standpoint. But it worked anyway. As the days passed, word spread of the odd little game. The first to discover it were the already somewhat obsessed — devoted gamers and programmers looking for inspiration and the next big thing. And then word reached beyond the usual indie circles. Within a couple of months, game blogs and discussion forums started teeming with accounts from enraptured gamers showing off their creations. The more they wrote, the more eyes turned toward Markus’s game. While all Markus did was continue programming and documenting his progress online. Total sales of Minecraft passed twenty thousand that summer, and it was with a dizzying feeling in the pit of his stomach that Markus realized he was well on his way to becoming a rich man. He remembers to this day the happy visit to the ATM that produced the bank statement that verified he had over $150,000 (SEK 1 million) in his account. He and Elin framed the bank statement and hung it on their apartment wall. “They say that the first million is the hardest,” Markus told his girlfriend with a satisfied grin. Soon Minecraft caught the attention of Markus’s own heroes. Brandon Reinhart, a programmer who worked on Markus’s favorite game, Team Fortress 2, wrote on the game’s blog that the next version of the game would probably be late. The development team had developed a deep and serious Minecraft addiction, he explained. “Yes, you should play this game,” he wrote, adding a link to Markus’s website. Sales more than doubled overnight. It wasn’t long before Markus was making more money from Minecraft than from his day job at Jalbum. He stayed on, but gradually cut back on his hours, and spent the other days at home fine-tuning Minecraft. Markus still believed the success was temporary. It will be over soon, he thought. Sales were not the only thing on the up-and-up. So was Anna. After being homeless and a drug addict, after giving Markus many empty promises about cleaning up her act, Markus’s sister was finally getting her life back on track. Going to rehab had led her to staying sober for several years, as did continuing to go to support groups. Now she had a new partner and a new baby daughter; a new life. For the first time since they were kids, Anna and Markus’s relationship did not revolve around her dependency and did not entail her asking him for cash. And while Anna still felt guilty about their past, Markus had already put it behind them. Even their father had been staying clean for longer stretches, and in that time Markus began to mend their relationship. He would sometimes visit Birger out at his cabin in the country, and the two of them would spend the weekend cooking, swimming, sitting together on the porch and admiring the landscape, and talking about anything and everything. Things between them were better than they’d been in years, and while his father’s drug-free period would turn out to be short-lived, to say that Markus enjoyed this time of his life would be an understatement. Markus had promised himself — even before Minecraft’s breakthrough — that he would, as soon as his finances allowed, dedicate himself entirely to his own gaming endeavors. He and Jakob had already invested innumerable hours in daydreaming about the game studio they hoped to create together; they already knew where the money from Minecraft would go: into developing Scrolls. Also, Markus was tired of coding alone. He needed someone to bounce ideas off of and hang out with during the day. Giving notice at his day job was no small decision, and Markus found, to his surprise, it was more difficult to do than he’d expected. He still didn’t believe his success was going to last. Sure, the money was rolling in right now. But in six months? A year? Add to that the fact that Markus had left behind his messy apartment in Sollentuna and had moved into a place with Elin in Kärrtorp. It was more important than ever to be able to count on a stable financial situation. Jakob was facing a similarly tough decision. Unlike Markus, he had stayed on at Midasplayer, and the company continued to earn serious money. He’d been asked to step up and manage the company’s game developers. For a father with a toddler at home, it was a very attractive offer. A management job with a great salary, at a company with a promising future. Jakob and Markus found themselves at the same crossroads that most people with entrepreneurial dreams encounter at some point in their lives. On the one hand: a secure work life, with a permanent job and a monthly salary. On the other hand: a rare opportunity to realize a dream. With Minecraft in their back pocket, they couldn’t ask for better circumstances. But daring to take the next step … they would need a little shove. That little shove came in early August 2010 in the form of a phone call to Markus’s cell phone. He answered and a polite American voice sounded on the other end. The voice introduced himself as a representative of Valve Software, congratulated Markus on Minecraft’s success, and wondered if the Swede might be interested in visiting Valve’s head office in Washington State for a cup of coffee. To understand why Markus still gets excited when that phone call comes up, you have to appreciate the special status Valve enjoys in the gaming world. The company elicits approximately the same type of response from gamers as does Apple from gadget lovers. Valve’s first hit game, Half-Life (from 1998) is still praised as one of gaming history’s most revolutionary titles. The same goes for its sequel, Half-Life 2. Valve is known mainly for two things. First and foremost, the studio’s uncompromising focus on quality rather than on quantity — in its almost fifteen years of existence, Valve has only released a handful of games. There’s also an unbelievably long time span between releases; Half-Life 2 came out almost six years after part one in the series (but to be fair, honed to perfection). Valve’s inordinately long gestation period has given rise to the expression “Valve time” — meaning the difference between the time that Valve promises a project will be finished and when it actually is. The next sequel in the Half-Life story should have been released for sales on Christmas Eve 2007. Fans are still waiting for it, patiently. 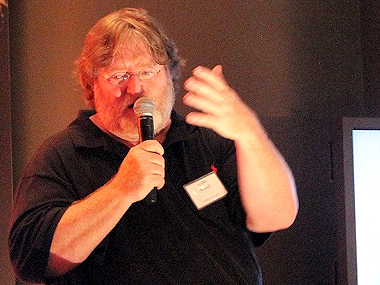 Valve co-founder Gabe Newell, in 2012. Second, Valve is an independent company, with its founder, Gabe Newell, still at the helm as CEO. Thanks to megahits like Half-Life, Valve has the revenue to be able to invest in untried ideas. So for many indie developers, Valve represents the “good” side of large-scale game development: nearly inexhaustible resources to put into exactly and solely the games they choose without the influence of “the suits.” Take Portal for example. The game was born from one developed by students at the DigiPen Institute of Technology. Valve employees caught sight of the game (Narbacular Drop, then) at a Careers Day at the institute. They liked it so much they offered the students jobs to develop it, and the result was one of the most talked-about and highly acclaimed game series of the first decade of the new millennium. Markus surmised that the person on the phone was probably not interested in just a cup of coffee. He intuited two possibilities behind the polite invitation: Valve was either interested in buying Minecraft, or Valve was going to offer Markus a job. It’s not unheard of for established game developers to take on successful indie projects, and it was possible that Valve had decided to now try to do with Minecraft what they’d done with Portal a few years earlier. But the American wouldn’t say more than that Valve was impressed by Minecraft and would like to meet Markus and get to know him. If they could agree on the time, the American would arrange both airline tickets and hotel. Despite the elusiveness, Markus didn’t need to think twice before answering yes. Job offer or no, meeting the Valve people, maybe shaking hands with Gabe Newell, that was every game developer’s dream. “Okay then,” Markus agreed — he hesitated a second, then decided to go for it — “but I want first-class tickets!” First-class tickets it was. The voice at the other end of the phone line thanked him and promised to make the arrangements as soon as possible. Markus would go visit Valve’s head office the first week in September. With the trip on the horizon, Markus and Jakob knew it would soon be time for a decision. There was no way Markus was not going. Yes, their plan to start their own studio in the fall was still the same, he told Jakob, but he still wanted to keep a foot in the door. You don’t just wave off a potential job offer at Valve without some consideration. “What would you say about moving to the United States?” he asked Elin a couple of days later. A Minecraft-made monument to the game’s most famous villain, the Creeper. In the time between the phone call and the ensuing Valve visit, interest in Minecraft grew at an astonishing rate. Markus watched in awe as the sales stats climbed to levels he’d never imagined. During one twenty-four-hour period, more than 23,000 copies sold. Almost one game every three seconds. One day Markus received a grim e-mail from PayPal. The e-mail explained that his account had been temporarily blocked because clearly, he must be involved in some kind of criminal activity to have so much money flowing ￼￼￼￼￼￼￼￼￼￼￼￼￼in so fast. At that time, Markus had almost $860,000 in his PayPal account. Swedish and international media outlets alike began to contact him, asking for interviews. Within a couple of months, from being one of thousands of anonymous amateur programmers, Markus had risen to the status of international gaming celebrity. It was around this time that the signature hat debuted in Markus’s life. He says he got the idea from Jakob, who showed up one day to a meeting wearing one just like it. Looks sharp, thought Markus, and went to find one for himself. After trying out several different styles, he chose a black fedora. A similar hat graces the head of Indiana Jones. Michael Jackson often wore one, too. Persson’s nom de Twitter, Notch. Markus says it’s mostly coincidence that the hat is ever-present in his ensemble. But it can also be read as a symbol of his sudden fame. While it’s not uncommon for programmers to work under an alias, few have created so definitive an alter ego as has Markus. Notch is as outspoken and boisterous as Markus is shy and taciturn. Markus likes few things less than speaking in front of a group of people, but on Twitter and his blog Notch will make X-rated puns and biting remarks to other game developers in front of an audience of hundreds of thousands. 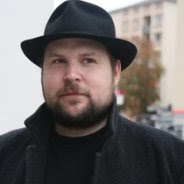 Markus seldom uploads photographs of himself on the Internet; instead he goes with the picture of Notch, a hand-drawn caricature, with a big, lavish beard and the trademark hat. Markus isn’t in any way secretive about his true identity, but it’s obvious that — consciously or not — he nurtures￼￼￼￼￼￼￼￼￼￼￼ two radically different sides of his personality. One is private, withdrawn, and has thinning hair. The other is public, likes attention, and always has the hat pressed down over his ears. Valve booked Markus at the Westin, the luxury skyscraper hotel in central Bellevue. He had a room near the top. Through the window, he could see far to the west, past the well-kept suburbs by Lake Washington to the city of Seattle beyond. Markus noted that all the luxury homes by the lakeside had pools. You could live a good life here if, if that’s what you wanted. Close to the water, lots of room, for both him and Elin. It had to be expensive, but a programmer at Valve, just a short drive away, could probably afford it. Meanwhile, things were still going undeniably well with Minecraft. A couple of weeks before his trip to the United States, Markus had asked on his blog if there might be some Minecraft players in the Seattle area who were interested in meeting up with him while he was in town. He was free all day Tuesday. Maybe they could organize something? “It doesn’t have to be anything fancy, perhaps a café somewhere. And I figured we could call it MinecraftCon 2010 even if it’s just three people sitting around in uncomfortable silence for twenty minutes,” he wrote. When Markus walked into the little park in Bellevue at the appointed time, more than fifty people had found their way there. Several streamed the gathering live on the Internet via their cell phones. Some were dressed as ￼￼￼￼￼￼￼￼￼￼￼￼￼￼￼Minecraft characters. One young man is seen in photos from the meet wearing a full-length Creeper costume built out of green-painted cardboard. For several hours, Markus answered questions about Minecraft and shared his thoughts on the future of the game and his plans for the company he was thinking of starting with Jakob. The sky was overcast when the meeting came to an end, but Markus walked away smiling ear to ear. The evening before his meeting at Valve, Jakob and Markus chatted on Skype. Jakob asked Markus what he would say if the question of employment came up, but he didn’t get a straight answer. “I want to find out what they want,” was all Markus said. Markus understood, just as his friend in Stockholm did, that there was a lot riding on the next day’s meeting, for both of them. If Markus decided to stay in Seattle, their common venture would never be. If not, they vowed to make it happen. “I’ll get back to you in twenty-four hours,” Markus promised. Once the conversation had ended all Jakob could do was wait. In the back of his mind, he realized that the next day would decide his fate. He would either accept the management position at Midasplayer, which would mean more meetings, more responsibility, and less time for coding and game development, or he and his best friend would launch their dream project. The decision was entirely Markus’s. Markus remembers his visit at Valve’s headquarters as a jumble of impressions. Before he was allowed into the office, he had to sign a nondisclosure agreement, promising not to tell anyone about the half-finished productions he would see in there. He met Robin Walker, the man who wrote the original Team Fortress and was employed by Valve to lead development of the sequel. Brandon Reinhart, who’d written the post on the Team Fortress 2 blog that made Minecraft sales soar, showed Markus around. Markus did indeed get to shake hands with Gabe Newell. The Valve boss was very busy, Markus recalls, but the fact that he seemed to know of both him and Minecraft felt like an honor. ￼￼￼￼￼￼￼￼￼￼￼￼￼￼￼￼Afterward, Markus was shown into a conference room with a man from Valve’s Human Resources department. The man spoke candidly about the corporate culture at Valve and what it was like to work for the company. Markus told him a little about himself and his plans for Minecraft before realizing that he was in the middle of a job interview. Valve had prepared a programming exercise. The man from the HR office — Markus doesn’t remember his name — asked Markus how he would go about programming an elevator. Markus thought for a while, then answered in as much detail as he could. The Valve representative listened, nodded his head, and fired some additional questions at Markus where appropriate. When the exercise was over, papers were put aside. The assessment: you are a gifted programmer, but you’re not used to working in a group. We can help you with that. Markus listened intently when the opportunities at Valve were described to him. It was perhaps the most sought-after place of employment in the business. A chance to make a difference and to be a part of the absolute cutting edge of game development. We would like to work with you, he was told. Are you interested in working for us? This is where the story could have taken a different turn. Markus could have said yes and moved to Seattle. Maybe he and Elin would have lived in one of the luxury homes by Lake Washington, with both a pool and a view of the lake. Maybe Minecraft would have become a downloadable game in Valve’s Steam shop. Maybe Markus would have simply left Minecraft behind to work with a couple hundred other Valve programmers on the next installment in the Half-Life series. But that didn’t happen. Markus describes it as one of the hardest decisions of his life, but when the HR person asked him that question, Markus answered politely but firmly. No. “Somehow, I felt that Minecraft was maybe my chance to create a Valve, rather than work at Valve,” he says today. On the other side of the Atlantic, Jakob sat at home in Stockholm, his cell phone in hand. It beeped. A new text message from Markus: “You can quit your job.” The next morning, Jakob did just that. 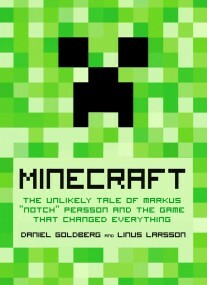 “Minecraft: The Unlikely Tale of Markus ‘Notch’ Persson and the Game that Changed Everything” was written by Daniel Goldberg and Linus Larsson and first published in Sweden in 2011. Its English translation, by Jennifer Hawkins, debuted in November.